Note: This Storefront extension is now available in the Storefront Powerpack, together with many other great features. Please see that documenation for the Powerpack features. Storefront Designer gives you additional style options to further customize the appearance of your Storefront-powered website. This extension integrates with WordPress Customizer, giving you new settings in several existing sections. Choose a different preset header layout. Default – How Storefront displays the header by default. Expanded – Moves the secondary navigation and search bar above the logo/title/tag line. Central – Aligns everything to the midline and works best when not using a secondary navigation, potentially hiding the search bar. Inline – Removes the secondary navigation/search box and displays the site title, main navigation and cart link in a single horizontal line. Gives you the option to lock the entire header or only the navigation to the top of the page as the user scrolls. Be aware that sticky navigation only works in conjunction with ‘Expanded’ or ‘Compact’ header layouts. Control text to display in the footer. 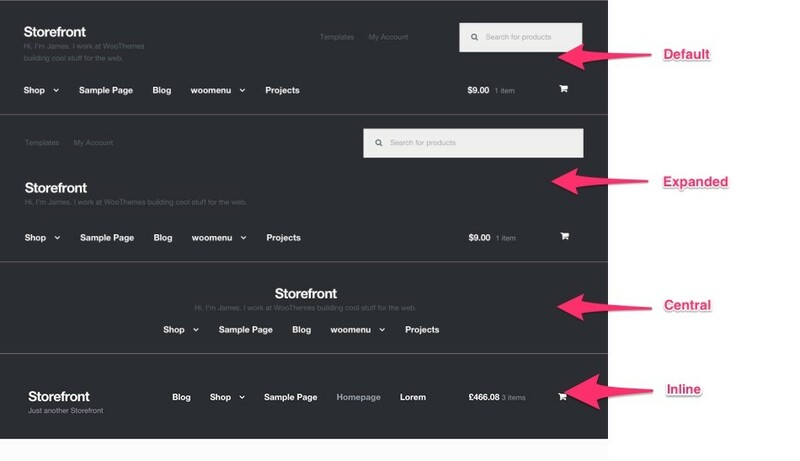 Toggle display of the Storefront credit note/link in the footer. Choose a solid fill background (default), a gradient background or transparent background. If you select gradient, the gradient is automatically generated based on the button background color setting. Buttons with gradient affect applied. Buttons with transparent setting applied. Specify the border radius of your buttons. Choose squared (default), small or full. Small will result in slightly rounded corners, full will result in fully rounded buttons. Buttons with rounded affect applied. Removes the default 3D effect applied to buttons by Storefront. Buttons with 2d affect applied. Changes the global font size which by association adjusts the entire web site scale. Choose from default, smaller or larger. Makes website content span the full width of the browser window rather than having a maximum width. Wraps the site content in a “frame”, offsetting it from the background of the web site. Content frame setting in action. Defines a background color for the content frame, separate from the body background color.